Social media, with its capabilities of fast, global information sharing, provides a useful medium for professional development, connecting and collaborating with peers, and outreach. 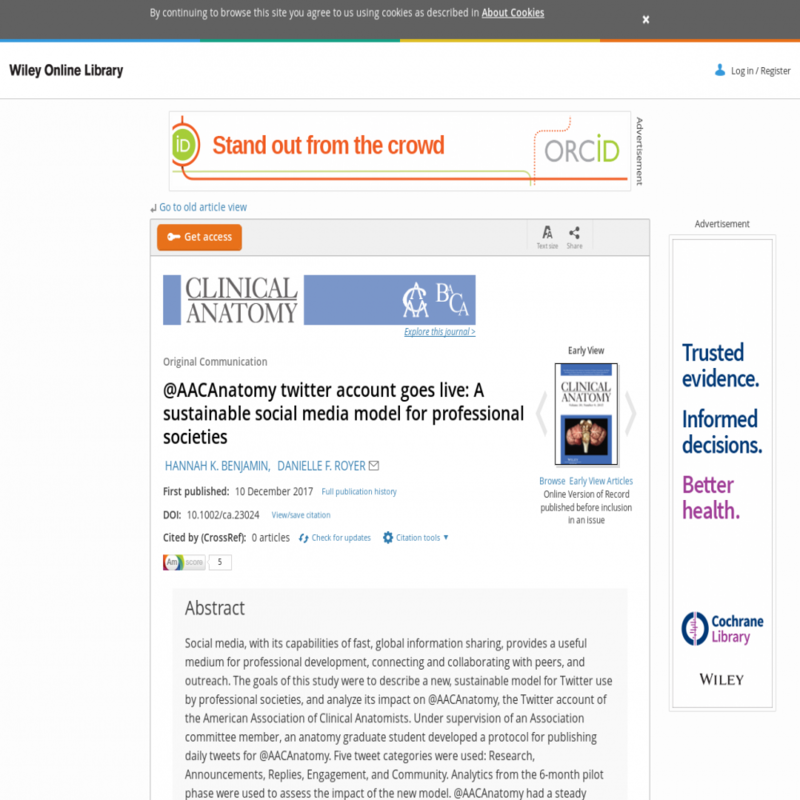 The goals of this study were to describe a new, sustainable model for Twitter use by professional societies, and analyze its impact on @AACAnatomy, the Twitter account of the American Association of Clinical Anatomists. Under supervision of an Association committee member, an anatomy graduate student developed a protocol for publishing daily tweets for @AACAnatomy. Five tweet categories were used: Research, Announcements, Replies, Engagement, and Community. Analytics from the six month pilot phase were used to assess the impact of the new model. @AACAnatomy had a steady average growth of 33 new followers per month, with less than 10% likely representing Association members. Research tweets, based on Clinical Anatomy articles with an abstract link, were the most shared, averaging 5,451 impressions, 31 link clicks, and 9 #ClinAnat hashtag clicks per month. However, tweets from non-Research categories accounted for the highest impression and engagement metrics in four out of six months. For all tweet categories, monthly averages show consistent interaction of followers with the account. Daily tweet publication resulted in a 103% follower increase. An active Twitter account successfully facilitated regular engagement with @AACAnatomy followers and the promotion of clinical anatomy topics within a broad community. This Twitter model has the potential for implementation by other societies as a sustainable medium for outreach, networking, collaboration, and member engagement. This article is protected by copyright. All rights reserved.